Tannat Malbec from Tarija, Bolivia: is a superb wine! Campos de Solano [sic] Malbec Tannat, Tarija, Bolivia 2016 (£11, Marks & Spencer) If Peru’s wine industry is relatively small compared to the regional giants of Argentina, Chile and Brazil, then Bolivia’s is tiny: having dug into my trusty Oxford Companion to Wine, I can say that there are around 3,000 hectares of vines in the country, which is a little bit more than the UK’s 2,000, but considerably less than Peru’s 23,000 (Argentina, to put this into context, has 224,000). So, tiny, but perfectly formed? Hard to say given that Marks & Sparks’s Bolivian red represents my sole experience of the country’s vinous output so far. But this meagre evidence is at least promising. Produced at altitude (1,850m) in the Tarija region near Argentina, it’s a forceful, gutsy, red with a soft sheen of sweet oak. Bolivian Thoughts opinion: For over thirty years my favorite wine was Shiraz from Bodegas y Viñedos de la Concepcion, also from Tarija. I have tried the Tannat Malbec from Campos de Solana and I must agree … is a superb wine. 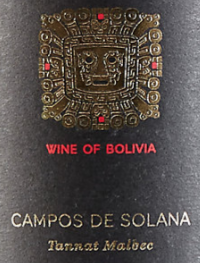 This entry was posted in Bolivia, Business, Environment, Holidays, Tourism and tagged Bodega Campos de Solana, competitiveness, Tannat Malbec, Tarija, wine. Bookmark the permalink. This wine is full of body , it is delicious but Marks does not have anymore please is there anywhere else one can get?